Let’s add another entry to the old series “Seeing things“! But first, here’s a hot off the presses press release from Marvel about how Daredevil is the best new series of the year. It also features some Daredevil #9 preview art! Now to the seeing portion of our programming. 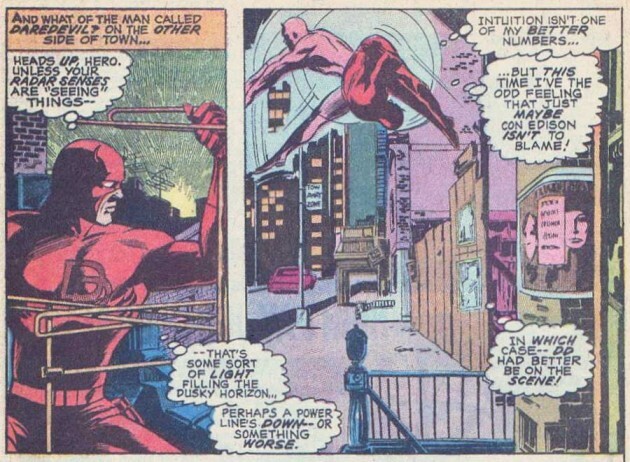 This little piece of he’s-not-supposed-to-be-doing-that Daredevil action comes from Daredevil #77 (volume 1), by Gerry Conway and Gene Colan. Nope, I call seeing goof on this scenario! Wait a minute, how can the horizon be ‘dusky’ if there is a light in it? Mysteries upon mysteries…..another great entry in this series.